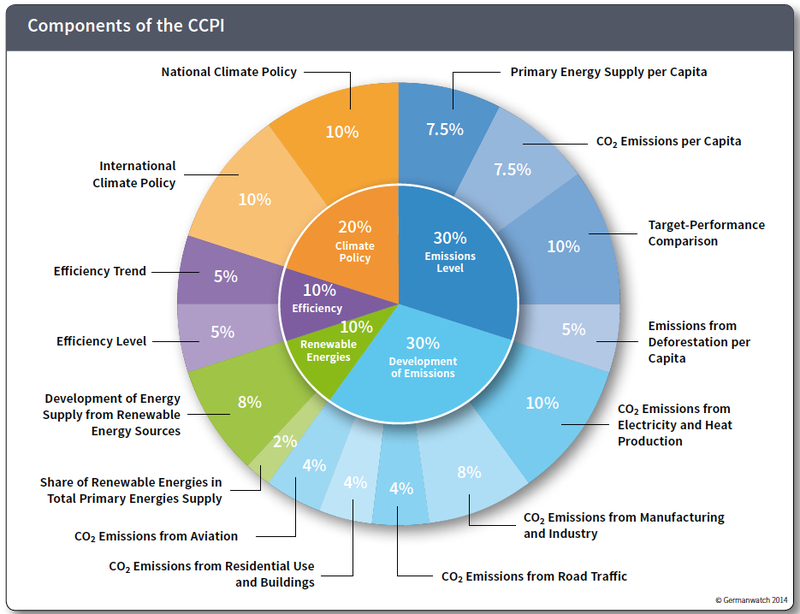 How Well Does the Climate Change Performance Index Perform? In previous posts (here and here), I was rather rude about the World Economic Forum (WEF)‘s Global Competitiveness Index (GCI). To me, the method of compilation of the index appears dishonest. Most people understand ‘competitiveness’ to relate to some kind of competition. Yet the WEF defines competitiveness to mean prosperity, measured by GDP head. The word ‘competitiveness’ is used as just a hook. Further, no evidence is given to suggest that maximising one’s GCI scores would later lead to higher prosperity. In short, we are implicitly encouraged to pursue WEF‘s political goals (basically neoliberalism), with the completely unsubstantiated promise that they will make us prosper. This criticism notwithstanding, economic indexes have their uses if they are transparent and honest. The big daddy of them all is the United Nations Development Programme‘s Human Development Index (HDI). Now 25 years old, HDI was introduced to counter the shortcomings of GDP. Simplistically, a developing country may have a relatively high GDP per capita number (due perhaps to some large resource endowment like oil) but a low level of development. As the chart below shows, human development encompasses diverse dimensions that go beyond a decent standard of living (click for larger image). The strength of the HDI itself is its simplicity. It is an equally weighted composite of only three factors: life expectancy, education (with two sub components of adult literacy and school enrolment) and GDP per capita. Nonetheless, it serves its purpose: to advertise to the world that politicians need to look at the capabilities of their populations, not just the level of wealth. Rather than choosing a simple HDI type index, the CCPI has followed the GCI route, with multiple categories and sub-categories, some of which are objective and some subjective (click for larger image). The Climate Change Performance Index is an instrument designed to enhance transparency in international climate politics. Its aim is to put political and social pressure on those countries that have, up until now, failed to take ambitious action on climate protection. It also aims to highlight those countries with best practice climate policies. 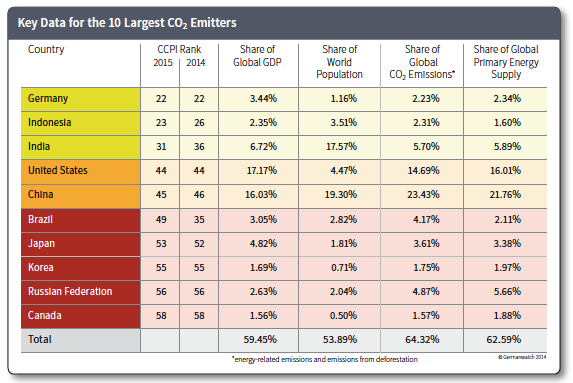 With its avowed political agenda, the CCIP report does highlight the largest carbon emitters and their standing in the CCIP league table (click for larger image in the table below), but the arbitrariness of the index weightings likely undermines the intended goal of ‘naming and shaming’ those countries dragging their feet over climate change. Further, the omission of any country from the top 3 places on the grounds that even the efforts of the best-performing countries are not doing enough appears an unnecessary stunt. The strength of the United Nations Human Development Index is that it didn’t try to do too much. What is more, its transparency meant that it was easily adopted by academics, aid agencies, multinational organisations and governments alike. It is difficult for a country’s leader to completely ignore his or her HDI standing; the same cannot be said for the CCPI. Overall, it appears that Germanwatch and Climate Action Network spotted a hole in the index market and rushed out a product to fill the empty niche. As a supporter of all those battling climate change, I admire their endeavour. However, for the climate movement as a whole, it probably would have been better if a major university or multinational agency had filled this hole first. Climate skeptics and disseminators of doubt were always likely to attack the organisations sponsoring this kind of index, but the avowed lobby group nature of Germanwatch and Climate Action Network will make them easier targets. At the end of the day, economic indexes are branding, advertising and marketing tools for policy promotion rather serious studies of cause and effect. Nothing wrong with that: in the 21st century, we are all used to having policies packaged and pushed. Yet the bar grows ever higher in terms of what is expected from those communicating the message. And we need trust in the entity pushing a message in order for the message’s content not to be ignored. Nonetheless, I will still check in on the CCPI when it is updated every year. It at least provides a starting point for a conversation–a conversation which the elites of many countries often don’t want to have. It’s just that a better constructed CCPI would have made a better catalyst for that difficult conversation. This entry was posted in Climate Change, Post Growth and tagged Climate Action Network, Climate Change Performance Index, Germanwatch, Global Competitiveness Index, Human Development Index, United Nations Development Programme, WEF, World Economic Forum. Bookmark the permalink.